This wiki cheese category page contains detailed information and photographs of cheeses produced in the English county of Somerset. 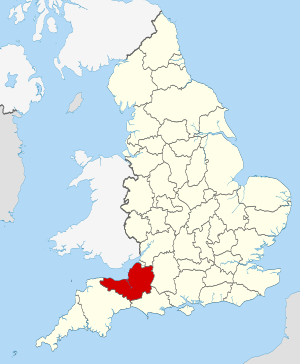 Somerset is a county in South West England. The county town of Somerset is Taunton, which is in the south of the county. The ceremonial county of Somerset borders Bristol and Gloucestershire to the north, Wiltshire to the east, Dorset to the south-east, and Devon to the south-west. It is partly bounded to the north and west by the coast of the Bristol Channel and the estuary of the River Severn. Agriculture is a major business in the county. Farming of sheep and cattle, including for wool and the county's famous cheeses (most notably Cheddar), are traditional and contemporary, as is the more unusual cultivation of willow for basketry. Apple orchards were once plentiful, and to this day Somerset is known for the production of strong cider. Pages in category "Somerset cheeses"
Page modified 11:11, 16 November 2015.